These are more experimental observations, all intensely interesting. The conservation of total energy and momentum holds without reference to fluorescence at all, so will the important photon mass calculation. The fact that frequency shifts are seen in a non absorbing martial means that they are not fluorescence. So now I will proceed to writing up Sections 1 and 2 of UFT279, a four author paper with Horst Eckardt, Gareth Evans and Trevor Morris, the two experimentalists. As GJE mention, anyone can easily reproduce these effects in glass with a laser and at home. Thanks both. I have had a quick look at this paper (could one of you send Myron a copy because I have broken the link somehow and now lost the paper at my end). 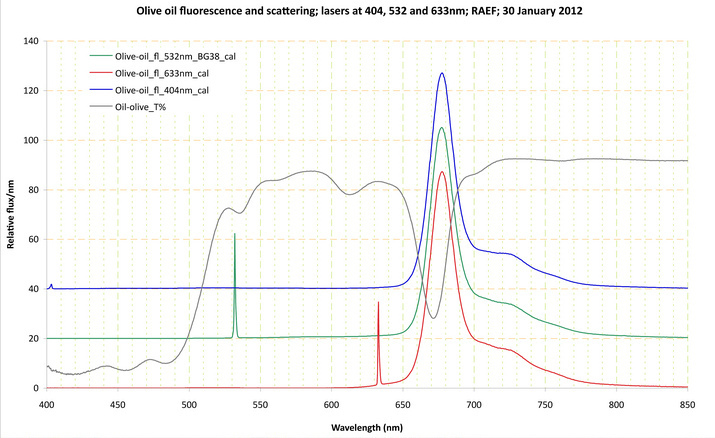 I agree with the general conclusion about the potential use of olive oil in laser technology. Their experiment is almost a perfect replica of Robert Fosbury ‘ s work (or vice-versa). It is good that there are now more examples of confirmation of the actual observations emerging. The authors of this paper (and Robert) attribute the frequency shifts to the chlorophyll at 680nm to fluoresence (after all this is all that was known to them). There are indeed some relatively weak absorptions in their transmission spectrum of olive oil. The authors of this paper “use these absorptions to excite the chlorophyll molecules and create the fluorescence”. There are no absorptions at all in the green part of the visible spectrum (which is why I have focused on it). So, they are not exciting chlorophyll molecules with green laser light (but some other molecules – if any at all). If they are not exciting chlorophyll molecules the incident radiation is not causing chlorophyll molecules to fluoresce. But their frequency shifts are to the well known chlorophyll absorption at around 680nm. This cannot be a consequence of chlorophyll fluorescence. They have not looked closely enough at the source of their weak absorption lines. If we can get close to reproducing these frequency shifts in olive oil (or formaldehyde, or both) it is going to cast great doubt over the interpretaion of much of the fluorescent work published in the literature. We now have a much better explanation of frequency shifts based on accurate first principles. Optics as we have known it was wrong. There are always frequency shifts in absorption and reflection. As for calcite Horst, if you can get hold of some Icelandic Spar you will easily see the frequency shifts. This crystal was used by Newton, and others around the same time, in discoveries that effectively laid the foundations of most of classic optics as we know it. They missed some things though because they did not have lasers (see photo 1). The first Icelandic Spar crystal on the right in the photo is illuminated by blue and green laser light at the same time from different directions. Green laser light changes to yellow and blue laser light to pale blue / white light in the first crystal. Blue laser light changes to red in the second crystal (pink Icelandic Spar). Fluorescence? Hope springs eternal, and it would have to. Sitting on a (hopefully) controlled hydrogen bomb does not sound like the best place to be. Agree with you sentiments entirely. LENR fans will believe this when they see it. They have been promising things like this for seventy years at the cost of many billions. I would not fancy boiling an egg with this contraption. LENR does the trick at a minute fraction of the cost of this thing, and also the cost of fossil fuel reactors. So AIAS Fellow Steve Bannister of the University of Utah is quite right, LENR will lead to a new industrial revolution, one that is needed pretty damn quick. Many thanks, these are important computations for the purpose of testing the validity of the linear approximation, which is soluble by Maxima. It is right to equate x / (1 – x) with unity for the one photon theory. The importance of this transition is that there is a continuity of concepts, i.e. the conservation of energy and momentum applies in the one photon limit. One cannot very well argue that one photon is refracted and one photon is reflected. The Planck distribution is an average over many photons – so the incident beam is always split into two beams, reflected and refracted. direct frequency comparison with temperature effects. This is obviously of great interest, we are getting close to a quantitative comparison. The light returns to its original phase velocity when refracted back from the medium (phase velocity v) into air (phase velocity effectively c). thanks for explaining this. An additional question: why does the scatteres light behave differently when leaving the crystal, compared to the main beam? I thought that there is no difference when light leaves the crystal, may it have been scattered or not. Concerning the coincidence of the frequencies of the refracted beams, the most simple standard explanation would be that light is absorbed and the chlorophyll line of the oil is emitted. However you have made clear that this is not the case. So we have to find an explanation by our theory. I just realized that the frequency curves depend heavily on the frequency of incident light. I will investigate this effect next. Sorry, I have been at football with Sion and my phone was out of battery (so I could not pick up e-mail). Yes, exactly Myron. This is why we have been looking for a frequency shift in glass (there is no absorption so there can be no fluorescence) and why I agreed with you that chlorophyll (in olive oil) is a good material to test the theory with. As can be seen in Rob Fosbury’s spectrum (attached), there is very little absorption (and not a lot of transmission) in the green part of the spectrum (this is why plants are green). So, the shift of the green laser line to the red, for example, is difficult to attribute to fluorescence (where a material has to absorb light, move into an “excited” state, and then re-emit light almost instantaneously of a different frequency). Also, blue, green and red laser light are shifted to exactly the same absorption in olive oil (an absorption of chlorophyll at 680nm). This is remarkable in my opinion (and also answers another question from Horst). It is also important to note that it is the beam of light itself that changes colour. In fluorescence, you usually see the whole body of the material emitting light. In a liquid like olive oil it is difficult to imagine how only the molecules in the path of a beam could become excited and undergo fluorescence. As Myron and I know well from our early research, molecules in a liquid are in a constant state of motion. They are not fixed in a lattice as in solids. If some molecules are excited by incident light you would expect the whole mass of the liquid to fluoresce because of molecular collisions and motions. If we can reproduce these shifts with your new theory this will be very difficult to argue against. As you say, it doesn’t matter if we describe the shifts in terms of frequency or wavelength. To question shifts of this magnitude is meaningless because you can actually see the colour changes (right across the visible spectrum). Skeptics would have to argue that red and green is blue – and I think we could ignore that! You are also exactly right on Horst’s second query Myron. As we have emphasised, the colour change actually occurs in the refracted beam inside the material. When the beam re-enters air it reverts to its original incident colour. Theory should also explain this – we now know that it can explain blue shifts. We see the colour changes inside the material in the scattered light that reaches our eyes (and this is where a detector needs to be placed to observe the frequency shifts). I presume this is what Rob Fosbury does in his experiments. So, to answer Horst, there are three frequency shifts in the spectrum above for olive oil from three different lasers and all are shifted to the chlorophyll absorption at 680nm. Yesterday I circulated details of a spectrum for formaldehyde because in this experiment one exciting laser beam is frequency shifted to a large number of vibrational absorptions. Chlorophyll is a large molecule (I suspect with liquid crystalline properties – because its similar general structure to some liquid crystals we worked on in the past). Formaldehyde though is a very simple molecule (one of the very first to be studied by spectroscopy I believe). So, these two species compliment each other very well. Chlorophyll, of course, is one of the most important molecules in biology. These are important remarks by Gareth and it will be very interesting to see how the theory and experiment compare. Agreed, there is in fact a double refraction. ok, thanks, I just wanted to be sure. The light from the inner of the glass is scattered to my understanding, therefore it can be seen. Nevertheless it has to pass through the surface again, with a possible additional requency shift. Gareth gave an argument against fluorescence which I distributed this morning, he mentioned that in order for fluorescence to occur, absorption of a photon must take place. This photon is reemitted at lower frequencies because the medium also emits heat. Gareth argued that in his numerous experiments with Trevor, absorption does not occur. His experiments in glass, a non absorbing medium, also show very large frequency shifts in the absence of fluorescence. I think that these experiments in glass also answer the second question below, because colour changes are observed directly in the glass. at one surface can certainly not be observed in this way. This will be most interesting as usual. I will first check the temperature effects in the linearized theory, compared to the single frequency theory. This would be of great interest, because it is the exact conservation of energy and momentum with the Planck distribution. Nothing else is assumed in the theory. In my opinion these equations are perfectly general and must be obeyed in any optical process involving reflection and refraction. A desk top these days is almost as powerful as the IBM 3084 of the eighties. Eqs. (4) and (5) of note 279(8) are non-linear, transcendent equations. In principle they can be solved by a zero crossing (root finding) method. I will look if Maxima can handle more than one equation simultaneously for this. In the worst case this problem has to be coded by hand. I do not believe that a supercomputer is necessary, that should be handable on a desktop. This note summarizes a scheme for comparison of experiment and theory using the linearized n photon monochromatic theory with conservation of energy and momentum. As shown yesterday by Horst Eckardt there are four possible solutions for the refracted frequency omega1 in terms of the incident frequency omega, and it is possible to produce refracted red shifts and blue shifts as observed experiemntally by Gareth Evans and Trevor Morris. In the first instance the refarctive index of olive oil can be used, n = 1.4665, to see if this is sufficient to produce red shifts. The angle theta3 appears to be unknown experimentally but it can be adjusted to try to produce a fit with data. I note that the frequencies in hertz sent over by Gareth are calculated from the wavelengths using the speed of light c as in Eq. (1). If this simple constant refractive index theory does not work then the complex refractive index must be used as described by Horst yesterday. The real and imaginary parts of the complex refractive index are given in Eqs. (10) and (11). The rigorous theory is given in Eqs. (4) and (5), using the Planck distribution. Can Maxima solve those equations? Probably not, a mainframe computer will probably be needed. I am sometime Junior Research Fellow of Wolfson College Oxford (Autobiography Volume Two) and I am quite interested in monitoring the level of interest from the various Colleges and Departments. In November 2014 to date there have been visits from computing Cambridge, Applied Maths and Theoretical Physics Cambridge, Statistics Oxford, St. Hilda’s Oxford, Jesus College Cambridge, Robinson College Cambridge, St. Edmund’s College Cambridge, St. Anne’s College Oxford, University College Oxford, and the University of Oxford gateway. Over the last decade there have been visits from a majority of the OxBridge Colleges and Departments, obviously these visits have been sustained. The same pattern emerges for all the Universities of the countries of Britain and the rest of the world. In some rankings, Oxford and Cambridge are number one in the world, in some other rankings such as webometrics the Ivy league is number one in the world, Harvard being top cat at present. You cannot tell a Harvard man anything because he knows it all already. Well not quite all, he is interested in ECE. My own University, Cornell, is currently number four in the world in the webometrics rankings, and there have been many study visits from Cornell and all the Ivy league over the past decade. The nineteenth quarterly archive of www.aias.us is due to take place on about 8th / 9th Dec., so I kindly request Michael Jackson to update the archive of the blog on pdf, so Dave Burleigh can post it. It will then be archived at the British Library in London from the National Library of Wales at Aberystwyth. I will finish the November 2014 entry for the Book of Sceintometrics in early Decemeber as usual, and that can also be posted for archiving. So there are multiple back ups and archives now of www.aias.us, which is obviously sweeping the world of science. Up to 27/11/14 for www.aias.us there were 71,258 hits, 13,531 reading sessions or distinct visits, 18.20 gigabytes downloaded, 2,843 items read from 95 countries, led by USA, China, Germany, Russia, Mexico, Italy, Australia, Britain, Canada, …. In recent months there has been a very sharp increase in interest from China. This month the most read item was the first volume of my Autobiography above my coat of arms on the home page, many of the UFT papers were read over a hundred times each. Obviously ECE is the new physics of the twenty first century, “The Post Einstein Paradigm Shift” of Alwyn van der Merwe. The Book of Scientometrics is now 276 pages long, and has been compiled daily since 30/4/04. It contains about sixty four thousand visits for www.aias.us from the sector I name “universities, institutes and similar”. This is the elite 2% of the readership. This total is increased by roughly 50% when www.upitec.org and www.atomicprecision.com are added, making roughly 96,000 visits from the top 2%, including all the best universities in the world webometrics rankings many times over in over a decade. So the total number of visits is about five million over the last decade. These are URL’s recorded by WebLog 2.53. There are nearly three hundred thousand reading sessions every year, so over a decade or so there have been about three million readings sessions, which corresponds in a first approximation with the roughly estimated five million URL’s. Each reading session results in an order of magnitude of ten readings, at a conservative estimate, so in a decade the ECE sites have been read on the order of thirty million times, perhaps much more. Obviously no real intellectual believes the old standard model of physics any longer. The interest has been sustained over a decade so is here to stay. It is archived on http://www.webarchive.org.uk , Science and Technology, Alpha Institute for Advances Studies. You are currently browsing the Dr. Myron Evans blog archives for November, 2014.